If you have been entrusted with managerial responsibility at a company, then it is of paramount importance that you should always have the interest of your company as well as your employees at heart at all time. No matter what, you should strive at all times to deliver top quality work under all circumstances because if you do not be a shining example to the workers then chances are that your employees will not take their job seriously. For your benefit, given here is a list of ways in order to help you give constructive as well as valuable employee feedback. Giving and receiving feedback should be a must process is every organization. The following mentioned are few tips on how to give constructive employee feedback and the importance of feedback. 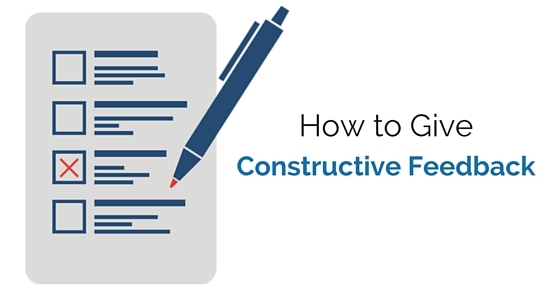 One of the first things which you need to know when you are going to give constructive feedback to someone is that constructive feedback is something which is positive and not negative. It is something which you give, not to feel better about yourself, rather it is so that you help someone who is new to the field in which you have considerable experience. It is of paramount importance to know that constructive feedback isn’t blamed focused in any way at all, nor is it a kind of tough love. So ensure that you do not speak off the top of your head at any time. You should embark on your constructive feedback by expounding upon exactly what it is that you have noticed. If you have noticed that someone’s very style of going about projects is wrong then you should make it a point to bring it to their notice so that they are able to know exactly how they ought to go about completing tasks at hand. So in order to give constructive feedback you have to ensure that you yourself know what you are talking about and that your observation powers are very good indeed so that you can give precise and accurate employee feedback. Being a boss or someone who has been entrusted with certain managerial responsibilities is a big task in itself, and you should ensure that you always carry out all your responsibility to the best of your ability. As someone who is in this position of authority, you should ensure that you speak in a manner which is befitting your high position. For example, your feedback should be meaningful and certainly not empty phrases such as ‘good job’, ‘well done’ or ‘nice work’. Giving positive feedback or reinforcement is most certainly a very good thing indeed, but it doesn’t qualify as feedback. There is nothing bad about giving constructive feedback, so you should not shy away from putting forth your thoughts to your employee when you really do have something truly meaningful to say. The person who you are speaking to most probably will be open and receptive to the advice which you are giving and if not he should improve his attitude otherwise he will never be able to move ahead in life. So ensure that when you are giving effective feedback you do not beat about the bush, rather you get straight to the point without any hesitation. When you are working in a big corporate company you should always try to keep working on your comprehension skills, because after all not all of us have been blessed with the gift of the gab. This having been said when you are giving your constructive feedback you should make it a point to speak in a very clear and comprehensive tone as someone who is a true well wisher. You should try at all costs to speak in a very respectful as well as polite manner so that you do not end up hurting the feelings of your staff. Be as a teacher giving a lesson to a student. Sure, giving your constructive suggestions or feedback is to a degree similar to a critique, yet this having been said, you should always try your level best to ensure that you in the event of trying to help someone better themselves, you do not go out of your way to be over critical, because after all no one is perfect and sometimes mistakes do happen. There is a way to give a feedback to people and you should not go out of the way to throw your weight around, especially if you are in a top position as then chances are that employees will not like you very much. Just because you are well read and have managed to climb the ladder of success that certainly does not imply that you have to walk around as though you have earned the right to act in a high-handed manner. The worst thing which you can do when giving constructive criticism to someone is come off as a know it all who will not even consider another individuals point of view. The mark of a true leader is someone who does not speak much but is able to get the point across in as few words as possible. Never give feedback merely to come across as an erudite individual. To be a true leader you have to be open as well as receptive to what others have to say, if you are a closed and do not take into account what others have to say, then, unfortunately, you lack the necessary qualities which are a prerequisite to becoming a good leader. So as a leader in the office you should give constructive feedback to the best of your ability but at the same time you should give people the freedom to get things done their own way and allow them to take a few calculated risks as well. You never know when these risks may pay off. A great way to explicate what you are trying to say is by using examples which could really go a long way in helping your employees understand exactly what you are trying to tell them. The simpler your examples, the faster you will be able to get your point across. As we all know parables have been a medium of expounding knowledge since ancient times where even Jesus Christ, taught by means of parables, using simple everyday examples to explain heavenly and eternal truths which otherwise wouldn’t have been understood by the common man. Giving constructive criticism is something that is a positive thing indeed, yet at the same time you should know that the best way to give advice to the person concerned is face to face, because as we are all well aware, that your tone of voice, your hand gestures, as well as your body posture, could really make a big difference indeed. Giving criticism over the phone or though someone else just does not have the same impact as doing it face to face. So if possible make an appointment with the individual as soon as you have something to tell him or her. One of the worst mistakes you can make when giving employee feedback or constructive feedback to someone is making them feel small among the various other workers, colleagues as well as co-workers of the office. So make sure that you do not make any employee feel small, as the manager or boss of the office, it is your responsibility to always have the interests of your workers at heart. So no one is stopping you to provide feedback as much as you can, to the best of your ability but make sure you do it in a proper and professional manner so that you do not generate any kind of ill will. There is a difference between giving your constructive feedback to someone and not being able to let go of bygones. If a particular worker has made some mistake and is well aware of where his errors lie, then you should not make it your business to keep reiterating the obvious as your words will have absolutely no value at all. So your primary aim behind giving constructive feedback for employees is so that you can help the particular individual improve himself and climb the ladder of success slowly but surely. When you are giving your constructive employee feedback, you should ensure that you choose your words very carefully, lest you end up saying something mean or even out of line. So make sure you are direct, informative as well as to the point. Speaking for hours on end is only going to make the individual feed terribly bored. You should ensure that the person you are speaking to, knows that the only reason you are giving your feedback is because you believe that this individual has the capability to become someone really successful in the time to come. Giving your feedback is something you are free to do, yet that is only the first step, you should follow up and see if the person concerned has even bothered to take into consideration what you have said. If you know that this individual is refusing to pay attention to what you have to say then in the future maybe you should refrain from trying to help the individual. Yet if you are a manager, it is absolutely mandatory that you try your very best to ensure that this person does listen to what is being said as it help in improving himself. In the event of giving constructive feedback to someone, it is of paramount importance that you ensure that you are giving the other person a chance to defend himself. You never know that when giving feedback to employees, you might pick up a thing or two from the manner in which the other individual thinks as well. Having creative discussions with other bright people is the best way for you to learn new things as well as get multiple ways to approach one single problem. There is some truth in the common saying that empty vessels make the most noise’ so ensure that you are not one of those individuals who merely go about giving your feedback without looking into your own work. So make sure that you do not unnecessarily speak too much even when not required. So these are some of the tips which you can make use of so as to ensure that your employees are motivated and feel like their hard work is being appreciated. More than giving any kinds of empty praises it is better if you put your mind in trying to give constructive criticism which could go a long way in helping the employees better themselves and contribute even more to the success of the company. A company will never become a success if the employees do not grow and improve with time, your words could really make a very big difference indeed. Previous articleHow to Manage your Team to Deliver High Standards?